I’ve become obsessed with this occupation of Malheur National Wildlife Refuge near Burns, Oregon. Sagebrush Rebel terrorists decided to take a stand at a remote wildlife refuge to protest ranchers sent to prison for covering up mule deer poaching with arson, and are somehow trying to take back an 1800’s way of life that entitles them to use our western lands however they wish for free, because dammit, the Federal government has overreached and there is too much government, and they say this isn’t terrorism, but they’re heavily armed and willing to die. Or some such myopic nonsense. They have signs protesting the Bureau of Land Management (BLM), even though the land they’re occupying is managed by the U.S. Fish and Wildlife Service (USFWS). American flags are draped all over the refuge, even though they’re protesting the Federal government. None of what they’re doing is constitutionally defensible or upheld in any way by the Supreme Court. It is simply domestic terrorism and these yahoos playing army give sustainable ranching a bad name. The National Wildlife Refuge System is made up of over 500 refuges that offer unique and rare opportunities to view wildlife, recreate, and celebrate our natural heritage. The refuge system is part of a public lands network managed by the USFWS, the BLM, The US Forest Service, and the National Park Service. Roughly half of the land in the American West is public, millions of acres that every American owns the same deed of ownership to. As I watch this news cycle unfold, I see politicians posture to defend this sagebrush rebel idea that folks are somehow being persecuted by a system that won’t allow them to graze cattle, drill, and mine wherever they want. Here’s an idea: choose a different way of life. After prison. Our public lands system is one of the best ideas we’ve ever had and is rare in the world. It’s too easy, simple-minded, and lazy to marginalize a place because of its remoteness – the very quality that makes it extraordinary. I’ve not been to Malheur, but most of my work is on public lands that won’t grace glossy calendars, places without the aura of our celebrated national parks. Places like Rocky Mountain Arsenal NWR, Siskadee NWR, Jack Morrow Hills, Adobe Town, Arapaho NWR, Cochetopa SWA, and so many other largely unknown lands in the west are refuge for the wildlife that we celebrate – it’s where we go for inspiration and solitude, to get lost in the grunt of rut, melody of meadowlark, call of the eagle, crane, and loon. This sagebrush rebellion won’t likely go away anytime soon; hell, Ronald Reagan called himself a sagebrush rebel; but this thuggery aimed at stealing our natural inheritance, robbing us of a chance to be inspired will not stand. We carry cameras and binoculars, support western communities, and we like our public lands just fine. Large unbroken expanses of western lands are the present and the future; our defense against climate change, extinction, and ignorance. Posted in News, Rocky Mountain Arsenal NWR, Sagebrush Sea and tagged national wildlife refuges, rocky mountain arsenal nwr, sagebrush rebellion on January 5, 2016 January 5, 2016 by Dave Showalter. Greater prairie-chicken male booming during mating display. Switzer Ranch, with Calamus Outfitters. Nebraska Sandhills. Posted in Prairie and tagged grassland, greater prairie chicken, lek, mating, nebraska sandhills, prairie on April 18, 2015 April 18, 2015 by Dave Showalter. Returning to the nearby owl nest, I was hopeful that I’d see one of the adults on the nest with her young. A storm was coming with three inches of snow predicted and I wondered how this open broken cottonwood nest would fare. Of course they’d made it this far and mom could tough it out. With the sun setting on a pewter grey evening, winds picking up, and clouds rolling in over the Front Range, mom had her three young tucked underwing; two of them visible in this frame. I decided to go back the next morning to check on them. At first light, mom was off the nest in a thick cottonwood gallery forest nearby. Two of the owlets had their fluffy heads barely poking up. Everyone was fine, and that day one of the owlets fledged from the nest to a roost in a pine across the irrigation canal, soon to be hunting skunks and rabbits. Posted in Prairie and tagged animal young, grassland, great horned owl, prairie, raptor, spring on April 13, 2015 by Dave Showalter. Great horned owls are early breeders and the young are early to fledge in spring – these owlets are within a week or two of fledging. The nest is in a broken cottonwood trunk, situated in a neighborhood along the busy Ralston Creek bike path. The cottonwood gallery forest supports a wide range of wildlife – while viewing the owlets a kingfisher loudly made his presence known as he darted around the riparian area. My young friend Austin located the nest by finding owl pellets, some with tiny rodent limbs. Owls eat their prey whole and regurgitate the pellets with the animal parts they can’t digest. There’s a magnificent world of wildlife to explore in our backyard – in this case look down, then look up. Posted in Prairie and tagged backyard wildlife, cottonwood, great horned owl, owl, prairie, raptor on March 31, 2015 by Dave Showalter. This year’s backyard bird count has begun and is the inspiration for this meadowlark image pulled from the vault and dusted off. In my first winter of photographing at Rocky Mountain Arsenal NWR, I was surprised to see small flocks of western meadowlarks picking for seeds in a world covered with hoar frost. It was about -10F when I made this image, which doesn’t phase meadowlarks – as long as they can forage. Lately, the number of wintering bald eagles has dropped as they’ve begun their northern migration, their void filled by sweet melodies of meadowlarks. It’s been an unusually warm winter (who knows what spring has in store?) but meadowlarks would be returning to Colorado’s shortgrass prairie anyway – they’re on schedule. Back then I was shooting with a Nikon F5 and absolutely in love with that film camera. You could pound nails with one of those things and I even told Marla that I thought I was all set for gear – who could’ve predicted the digital revolution of the last decade? Posted in From The Vault, Rocky Mountain Arsenal NWR and tagged cold, frost, grassland, meadowlark, prairie, rocky mountain arsenal nwr, songbird on February 13, 2015 February 13, 2015 by Dave Showalter. These small falcons look like tiny missiles while hunting. Preying mostly on small birds, the powerful merlin is fast and muscular; able to turn at very high speed in mid-air. The prairie (Richardson’s) merlin is 10″ tall and weighs about 6 ounces. Posted in From The Vault, Rocky Mountain Arsenal NWR and tagged colorado, falcon, grassland, merlin, prairie, rocky mountain arsenal nwr on February 11, 2015 by Dave Showalter. An adult bald eagle returns to roost, one winter evening. Rocky Mountain Arsenal NWR, Colorado. There are sixty or so bald eagles roosting at Rocky Mountain Arsenal NWR this winter, right on the edge of Denver. The eagles come back every year, using the tall cottonwoods for hunting perches to pick off a prairie dog or cottontail rabbit, and sometimes feast on winter-killed white-tail and mule deer. The eagles that return from Canada and Alaska join a resident pair that have a gigantic nest in a cottonwood gallery forest located in the middle of the refuge. Bald eagles are roost communally, and you can see them leaving the roost in blue-black predawn light, threes or four at a time traveling low across the refuge. They return in the evening, generally one at a time and over the course of an hour or two, until a few cottonwoods at the roost site are full of bald eagles, like dark ornaments. They chatter and fight for a favorite branch to spend the long winter night. Some of the eagles stay on the refuge to hunt, using cottonwood trees and decommissioned telephone poles. Others leave, possibly to fish along the South Platte River. Photographically, it’s somewhat of a mystery how to best position myself to make images of the eagles leaving and returning. I do my best not to bump them off of loafing perches – they spend up to 90% of their day loafing, or resting to conserve energy in winter. But it’s maddening to see them flying all over the refuge, just high enough or or too distant to photograph. For this image, I stood sentinel in a forest of cottonwoods where I’ve seen eagles graze the tops on their evening flight to roost. This particular eagle flew right over my head, a bit higher than I would have liked, but still thrilling. If you remember the days of DDT and how rare and endangered bald eagles were in the ’60’s and ’70’s, it’s still a rush to see one up close. Posted in Prairie, Rocky Mountain Arsenal NWR and tagged bald eagle, colorado, grassland, prairie, rocky mountain arsenal nor, roost, winter on January 29, 2015 by Dave Showalter. It’s Friday, follow your muse. Posted in From The Vault, Prairie on November 14, 2014 by Dave Showalter. Posted in Prairie on October 13, 2014 by Dave Showalter. 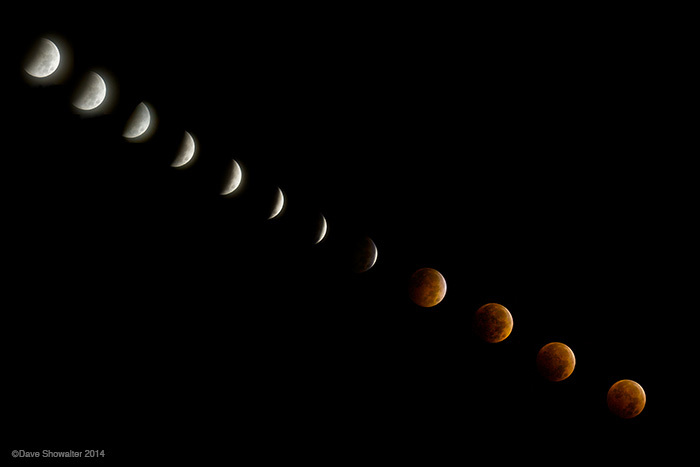 A composite image showing the progression of the 'blood moon' lunar eclipse, October, 2014. Last night moongazers across the world marveled at a lunar eclipse. The hunter’s moon, or “blood moon” passed through the earth’s shadow, turning a beautiful glowing red. Here in Colorado we had a total lunar eclipse and mostly clear skies until the moon returned to full near the horizon, our signal to go for bagel and coffee. It’s remarkable how losing sleep to be amazed by nature is energy giving. 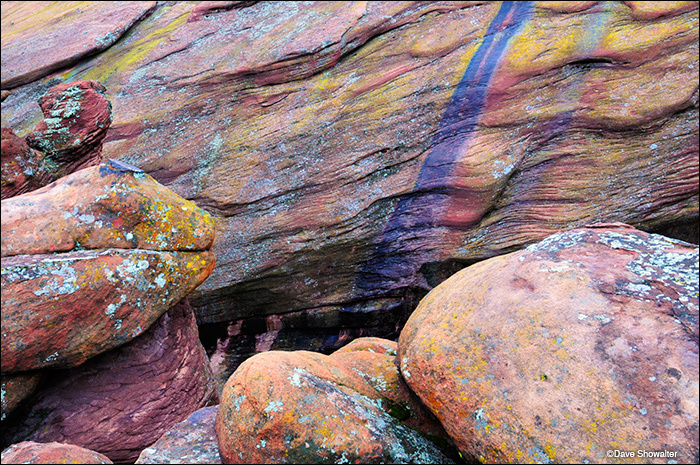 Posted in Prairie on October 8, 2014 October 8, 2014 by Dave Showalter.